Have Fun 'Til You're Done! The "Estate Planning 101® Course" is presented in online, or video/workbook format. Each of the 8 classes has valuable information which will help you make better decisions for you and your family. Click here for specifics on the topics covered. Contact us with any questions: info@estateplanning101.org or call 888-701-1954. 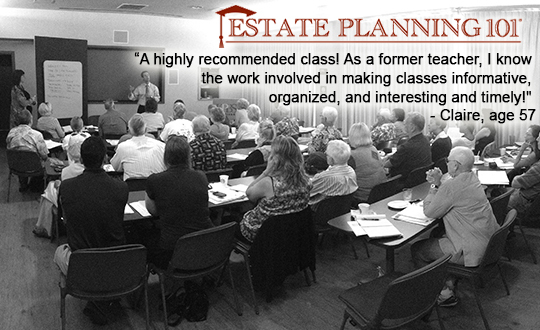 It is the Estate Planning 101® mission to educate the public on the estate planning process. Many people know having an estate plan is important, but the process can be daunting, and too many have put off planning until it is too late. Our mission is to provide you with better questions to ask about your own estate plan; teach you how to work effectively with ethical professionals and to empower you to maintain your Quality of Life to the very end. "In preparation for speaking at your upcoming Estate Planning 101 series, I watched the entire four-part workshop series. I found the series extremely thorough yet presented in a manner that was simple and easy to comprehend. Marguerite injected humor into the presentation which is not easy to do with a subject like estate planning. As an estate planning attorney I have attended literally hundreds of estate planning courses. The clarity of this course far exceeds any that I have ever attended."